Based in California you might expect a difference between the UK / Hull Yorkshire but I was struck by how similar they were. In comparison with the plastic versions sat on our table tops, treadle machines appear large and cumbersome. A more traditional view of an antique Treadle. There is an upper section – the machine itself – which sits on a built-in cabinet and a section underneath made of cast iron. Some had a motor attached but originally they were built as a manual machine; to use it without electricity requires you to learn some adept foot, hand and eye co-ordination! Read this great post on Witness2Fashion “Thinking About Sewing Machines” which takes you through their history in words and pictures. 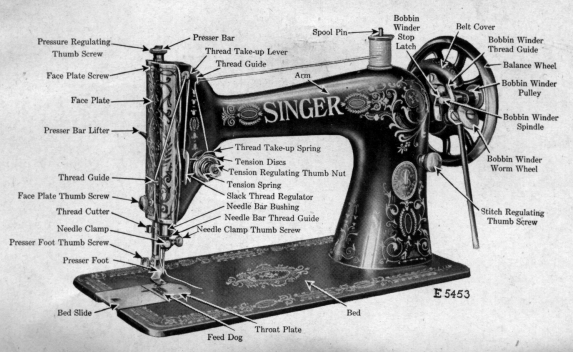 Researching The House of Mirelle has included a lot of discussion about treadles; a sewing machine manufactured in the 19th and 20th centuries by big names like SINGER. 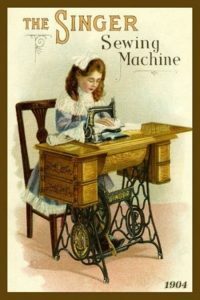 When our post about the Orphan Sewing Machine was published it prompted a flurry of comments and likes. Sewers recognised the photo instantly: “that’s the one I learned on! !” someone said in Australia fast followed by “me too” by someone in Yorkshire. Far from defunct treadle machines travelled the world and are still used today. 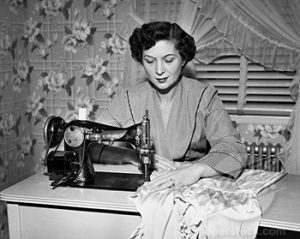 Using a treadle machine in the home circa 1950. Source unknown. “I later became a theatrical costume designer and teacher, and sometimes wished I still had that machine, because you controlled every stitch. You controlled the speed. Great for sewing in tight spaces, like children’s armholes. And you got some exercise while using it! “Yes, you had to get it started by turning the wheel by hand, but unless it came to a complete stop, it would continue to respond to a foot on the treadle. 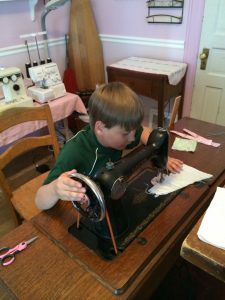 She added: “I think the museum may have rejected the treadle sewing machine because there were so many thousands of them that they are not rare. 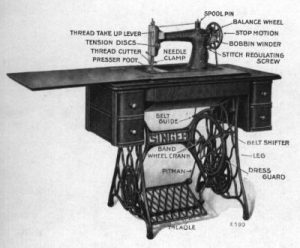 Simple diagram of a treadle sewing machine. “There are many places — even in the “developed” world, without a steady supply of electricity. future because everyone can pay bills and buy groceries with their phones now. “I was surprised how much I learned (or had my memory jogged) from old sewing machine advertisements. “Perhaps sewing machines were designed with that single power source in mind and the design was never re-considered for electric machines? A young boy uses an antique treadle sewing machine. He’s setting the treadle off by turning the wheel by hand! “Ours was probably from the 20th century, so not exactly like the really early ones. Thank you Witness2Fashion for sharing your thoughts and experience. The treadle is a global leveller and like the machines themselves memories of using them last. Whether it’s the physical action, the machine itself or the clothes that were created people’s recollections appear fresher and stronger than using modern ones. ** 11/1/2018: after publication Witness2Fashion contacted us to say that she thought the Time Team episode was Series 13 Episode 3: Rubble At The Mill / Manchester Cotton Mill. We recommend watching it. It uncovers the social history and working conditions of the people working in the 17th, 18th and 19th Centuries when the cotton and textile industry turned a small town into the bustling City of Manchester it is today. Previous Post Hull Fashion History: What Was Great About 1978!